This page lists the principal rivers of Europe with their main attributes. The border of Europe and Asia is here defined as from the Kara Sea over the Ural Mountains and Ural River to the Caspian Sea. While the crest of the Caucasus Mountains is the geographical border with Asia in the south, Georgia, and to a lesser extended Armenia and Azerbaijan, are politically and culturally often associated with Europe; rivers in these countries are therefore included. The list is at the outset limited to those rivers that are at least 250 km long from the most distant source, have a drainage basin (catchment area, watershed) of at least 10,000 km², or have a mean discharge (volume, flow) of at least 150 m3/s. Also included are a number of rivers (currently 47) that do not meet these criteria, but are very well-known and/or nearly make the mark. Examples of these are the Arno, Ruhr, Saar, and River Clyde. See the lists of rivers for individual countries linked to at the bottom of the page for smaller rivers. The rivers are ordered from those flowing to the extreme northeast into the Arctic Ocean, following the coastline anticlockwise all the way to the southeastern coast of the Black Sea. Iceland and the British Islands are included via virtual connections with northern Norway and across the Strait of Dover and the North Channel, respectively. Finally, rivers draining into the Caspian Sea are listed from Azerbaijan to the Ural River. The table can be sorted over each column. The first three columns give a ranking for (maximum) length, area and volume of those rivers flowing into the sea or an endorheic lake down to the cut-off values. No ranking of tributaries is attempted, as the concept is too contentious; for example, hydrologically the middle and upper Volga could be considered a tributary of the Kama, in which case it would be the fifth or sixth longest river in Europe. Instead it doesn’t appear in the table at all. The provided measurements are drawn from sources deemed most reliable, but still are often uncertain, especially when other sources disagree wildly. For example, the Siret in Romania and Ukraine is 726 km with a basin of 44,000 km2 according to the Great Soviet Encyclopedia, 647 km (44,811 km2) according to a Romanian management plan for the Siret basin  and 559 km (47,610 km2) according to the extensive transboundary rivers study by the Economic Commission for Europe. Length estimates for rivers depend on a number of variables. 1) The estimate will be larger when the river’s curves are traced at a smaller scale. 2) The choice of the source obviously has an impact. Here we attempt to list the most distant source. When that involves a tributary nearer the mouth of the river, the length of the nominal river is listed as well, if it meets the above criteria. 3) Rivers flowing into estuaries have an arbitrary end. Its channel through an estuary is usually included in the length when it is exposed at low tide. 4) The length of a watercourse through a reservoir or lake is open for interpretation. For this table, when a source for the total length of a river system involving lakes is lacking, the shortest courses through the lakes is used. 5) Over time, a river’s length can change (usually decrease) through canalization, the creation of reservoirs, and natural changes in the water course. The catchment areas are more consistent between sources. However, in low relief the watershed is less obvious, while underground connections (especially in karst systems) further complicate area measurements. Unless excellent sources are available, the areas below 70° latitude are taken from the HydroBASINS project. The River Networks and Ramsar Sites Information Service websites provide convenient interfaces to assess the accuracy of many of the basins. Areas for rivers above 70° are warned and found to be less reliable. The listed multiyear mean discharges are even less reliable than the lengths. Underestimates are most common, as the gauging stations are often far above the mouth, so that only a fraction of the drainage basin is represented. On the other hand, the highest volume of a river may not be at the mouth due to water loss by human usage, diversion (e.g. through distributaries), evaporation, or underground drainage. ^ Countries through which the river flows. Like the tributaries, these are ordered from mouth to source. The river's basin may cover more countries than listed here. ^ The 111 km Syadey-Yu is the longest source river of the 199 km Korotaikha. ^ a b A single river with different names along its stretch. ^ The 1130 km long Vychegda joins the Northern Dvina 673 km from its mouth in the White Sea. ^ The Northern Dvina (744 km) originates at the confluence of the Sukhona (558 km) and the Yug (574 km). The Sukhona starts at the small lake Kubenskoye (a ~15 km course), which is fed by the 368 km Kubena. ^ The 231 km long Mekhrenga joins the 188 km Yemtsa, 68 km before it reaches the Dvina. ^ The 477 km Ustya joins the 575 km Vaga 259 km before the Vaga flows into the Dvina. ^ The 574 km long Luza joins the Yug 35 km before the Yug merges with the Sukhona to form the Northern Dvina. ^ The name of this river changes from Kubena (368 km) to Sukhona (558 km) after the relatively small Lake Kubenskoye (a ~15 km crossing). ^ Vozhega (140 km) runs into Lake Vozhe (<30 km straight crossing inflow to outflow), which is drained by the Svid (64 km), which flows into Lake Lacha (33 km long), where 416 km Onega originates. ^ The Segezha, 329 km from its most distant source, flows into Lake Vygozero 18 km away from where the Lower Vyg (88 km) drains it. ^ The 33 km long Umba flows in the 135 km Upper Vyg, 112 km before that flows into Lake Vegozero. This 80 km long lake is drained by the 88 km long Lower Vyg. ^ Talgiesdegi (48 km) joins Voloma (138 km) 113 km before that flows into Lake Segozero (mean flow 20 m3/s). This lake, crossed in a straight line in 35 km, is drained by the Segezha (59 km), which flows into Lake Vygozero (mean flow 74 m3/s). ^ Kem (18 km) and Čirka (16 km) form the headwaters of 220 km Čirka-Kem, which, confusingly, joins another much larger river named Kem 7 km below its origin from Kuyto Lake and 184 km before it streams into the White Sea. ^ Pistojoki (Pista in Russian; 110 km) feeds the ca. 98 km Kuyto Lakes chain, which, on the other side, is drained by the Kem (191 km). ^ River Kovda, flowing through many large lakes, has a given length of 233 km. Kovda drains Lake Topozero from the northwest; at the very southeast of the lake, 76 and 79 km via a straight course, the small rivers Karango (16 km) and Kondoya (13 km) run in the lake and form the most distant sources of the river Kovda. ^ Niva drains Lake Imandra, the longest distance over the complex network of lakes and rivers above it is unclear, though it is over 200 km. ^ Voronya (155 km) drains Lake Lovozero, which is fed by the Kurga (81 km) 15 km across. The systems starting with Mar'yok [ru]-Afanasiya [ru] (62 km, with a 30 km crossing) and Tsaga River [ru] (45 km, with a 48 km crossing) are nearly the same length. ^ The Lutto (Lotta in Russian; 190 km) flows into Lake Onozero, which, after a 66 km minimal crossing, is drained by Tuloma (64 km). ^ Karashoka (166 km) and Inarijoki (153 km) join to form the 200 km long Tana River. ^ Abiskojokk (40 km) feeds lake Torneträsk, which is drained after a 55 km crossing by the Torne (470 km). ^ Lake Kilpisjärvi is drained, about 30 km from its headwater's most distant source, by Könkämäeno. The Gobmeatnu tributary, which joins just below the lake, perhaps has a slightly more distant source. Könkämäeno (90 km) and Lätäseno (60 km) join to form Muonio (230 km). ^ The southeastern end of the lake Rostojávri, some 26 km from its most distant source is drained by the 266 km long Rostoeatnu- Lainio river. ^ Peranganjoki [sv] → Alajoki [sv] (together well over 80 km) → Lake Kiantajärvi (50 km crossing) → Emäjoki [fi; sv] → Iijärvi →Kiehimänjoki (these three 103 km together) → Oulujärvi (75 km course) → Oulujoki (107 km). The entire system above the lake Oulujärvi is also referred to as Hyrynsalmi. ^ The length of this system is a rough estimate. The Peranganjoki-Alajoki system (>> 80 km) feeds Kiantajärvi. After a 50 km course, this lake is drained by the 105 km long Emäjoki-Kiehimäjnoki watercourse, which feeds Oulujärvi. The entire system above this lake is also referred to as Hyrynsalmi. After a 75 km course through Oulujärvi, Oulujoki (107 km) takes the water to the Bothnian Bay. ^ Kokemäenjoki drains Kulovesi, the last of a large chain of lakes. The system starting with Keurusselkä , via Kuorevesi, Ruovesi, Palovesi, Näsijärvi, Tammerkoski, Pyhäjärvi, and Nokianvirta to Kulovesi is the central course, but its total length is tricky to define. ^ The 204 km Kymi river drains Lake Päljänne, which 120 km further north near Jyväskylä is fed from a network of lakes further north. The sources that feed the lake Koivujärvi are the most distant for Kymi. From there, the shortest route over the so called Rautalammin route [fi] (including lakes Pielavesi, Nilakka, Iisvesi, Kiesimä, Konnevesi, Kynsivesi, and Kuusvesi) and via Saraavesi and Leppävesi to Päljänne is 230 km. ^ The 844 km Volkhov system flows into Lake Ladoga ~92 km (shortest course) from where the Neva (74 km) drains it. ^ The 806 km long Pielisjoki system flows into the northeastern end of lake Saimaa. A ~260 km course through this complex lake leads to the 156 km Vuoksi exit. ^ Murdoyoki [ru] (41 km) → Roukkulanjärvi [fi; ru] (27 km) → Omelianjoki [ru] (7 km) → Torosozero [ru]-Leksozero (44 km) → Sula River [ru] (21 km) → Sula lake (7 km) → Lieksanjoki (132 km) → Pielinen Lake (44 km) → Pielisjoki (67 km) → Saimaa. The watershed area is a rough guess. ^ The 358 km-long Vodla system feeds into Lake Onega. After a 96 km crossing, 224 km-long Svir drains this lake into Lake Ladoga. ^ Olova (42 km) joins Ileksa (155 km) 135 km before that flows into Lake Vodlozero. After a 32 km direct crossing, this lake is drained by the Vodla (149 km). ^ The Volkov river (224 km) drains Lake Ilmen from the delta of the 620-km Msta-Tsna system. ^ Tsna (160 km) flows into Lake Mstino, which after 15 km is drained by 445 km Msta. ^ The Pededze (159 km) flows into the Alviekste 22 km below Alviekste's source in Lake Lubāns and 95 km before it drains into the Daugava. ^ The Angrapa (ca 170 km) is the longest source river of the Pregolya (123 km). The 89 km Gołdapa joins the Angrapa ca 100 km before the formation of Pregolya. ^ HydroBasins data support the 264 km estimate by the Polish source over the 289 km estimate by the Russian source. ^ The 772 km long Western Bug merges with the Narew and after a further 38 km flows into the Vistula 401 km above that river's discharge in the Baltic Sea. Though shorter, the Vistula has twice as high a volume at the meeting point. ^ The commonly quoted 194,424 km2 catchment area probably includes coastal waters. ^ The 772 km Bug joins the Narew 38 km before its confluence with the Vistula. The 38 km joined stretch used to be and locally still is known as Bugo-Narew. ^ Hydrologically and historically, the Narew is a tributary of the Bug, but by a decree of the Polish regime in 1962 the roles were reversed. ^ The 808 km Warta joins the 854 km Oder 237 km above the Oder's mouth. ^ Canalization reduced the length of the Oder from ca 1040 km to the current 854 km. ^ The Vltava (431 km) joins the Elbe 833 km above its mouth in the North Sea. The length and catchment area of the river include the estuary until Cuxhaven, where the estuary is 15 km wide, but the nautical channel only 400 m.
^ The length and catchment area of the Elbe includes the estuary until Cuxhaven, where the estuary is 15 km wide, but the nautical channel only 400 m.
^ The Spree (382 km) joins the Havel (334 km) 178 km before that reaches the Elbe. ^ The "Vereinigte Mulde" (124 km) originates from the confluence of the Zwickau Mulde (166 km) and Freiberger Mulde (124 km). ^ The 451 km Weser originates at the confluence of the 300 km Werra and the 220 km Fulda. The Weser and Werra originally had the same name (Wesera). The length and basin area include the Innere Außenweser, a channel through the estuary that is exposed at low tide. ^ The Leine (281 km) joins the Aller (260 km) 52 km before that reaches the Weser. ^ The length and catchment area include the river channel through the Dollard and Ems estuary, both mostly dry at low tide, up to Eemshaven. ^ The Oude IJssel (82 km, same length when starting from the larger Bocholter Aa or smaller Issel source rivers) flows into the 125-km IJssel 19 km below the IJssel's origin from the Nederrijn. The 106 km lower IJssel drains in the Ketelmeer, which is connected to the North Sea via the IJsselmeer and Wadden Sea. The upper IJssel was formed between the 600 and 900 CE as a distributary of the Rhine and provides 75% of the volume. 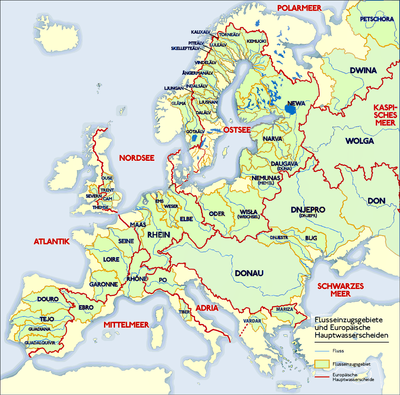 ^ Basin area excludes the Meuse basin, which could be considered a tributary of the Rhine. The discharge is that for the Rhine just across the border in the Netherlands before it breaks up in its distributaries. The total discharge to the North Sea is considerably higher. ^ The Alme (59 km) flows into the 220 km long Lippe 11 km below Lippe's source. ^ The Neger (20.5 km from both its Renau and Namenlose tributaries) flows into the Ruhr (219.3 km) 202.5 km before it runs into the Rhine. ^ 48 km Moselotte flows into the 544 km Moselle 43 km below Moselle's source. ^ Regnitz (191.1 km from its most distant source) flows into the Main, 133.2 km below its most distant source, and 391.8 km before its mouth. ^ The White Main (51.7 km) and the longer but smaller Red Main (71.8 km) are the headwaters of the Main (473.2 km). This course has the highest volume at each following junction. ^ The Pegnitz, for the first 15 km known as Fichtenhohe, joins after 127.3 km with the Rednitz, itself 123.7 km long from its most distant source, to form the Regnitz. After a further 63.7 km the Regnitz flows into the Main. ^ Until 1904, when the Bergse Maas was created, the Meuse was a tributary of the Rhine. Because of further canalization in 1970 the Meuse could be considered a tributary of the Rhine again. The catchment area and length include the Haringvliet and Hollands Diep estuaries, which are riverine at low tide. 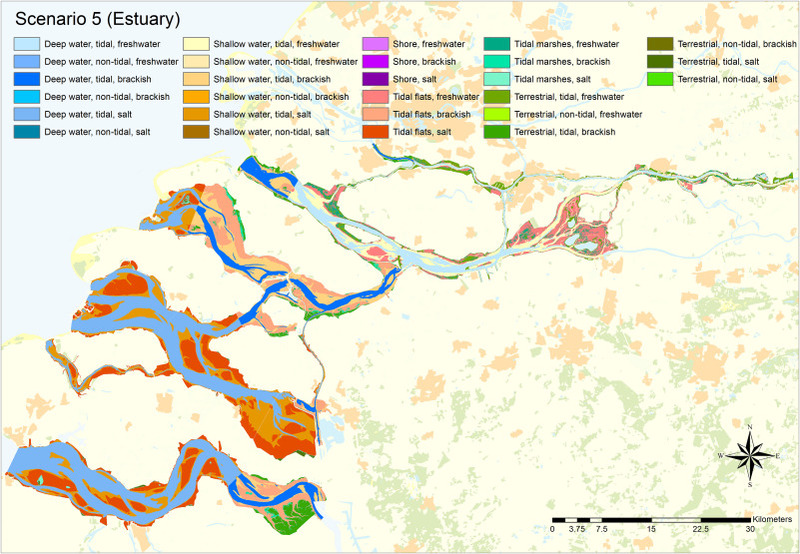 ^ The length of the Scheldt traditionally includes the Westerschelde estuary, which is riverine at low tide . The catchment area includes the complete delta (i.e. including the Oosterschelde), while the discharge is for that near Antwerp. Without the Westerschelde the length would be about 295 km. The source of the Leie may be a few km further upstream than the source of the Scheldt itself. ^ The traditional length of the Thames is 346 km measured from Thames Head to the very end of the Thames estuary at Foulness Point, past the Medway. The traditional catchment area of 12,935 km2 however is for a region above Gravesend and the Medway catchment area is not considered part of the Thames watershed. As a compromise, the given catchment area and length ends at the Medway (338 from Thames Head). The 25 km Churn joins the newborn Thames 3 km below its source to make the total length 360 km. ^ The catchment area and length exclude the Humber estuary and the River Don basin (1857 km2), which in 1628 was artificially diverted to Rivers Aire (and eventually Ouse) via the Dutch River, but in 1802 was reconnected to the Trent via the Stainforth and Keadby Canal. Discharge is 89.5 m3/s for 80% of the catchment area. ^ The catchment area and length exclude the Humber estuary, but the catchment area includes the River Don basin (1857 km2) (see River Trent). ^ Catchment area and discharge include that of River Earn but exclude the Firth of Tay. It's unclear if the Firth is included in the length. ^ A 102 km long estuary is excluded from the length and catchment area; this estuary has a basin of 15,700-16,800 km2. ^ The 516 km long Marne flows into the larger Seine 361 km before it drains in the English Channel. ^ The Aire (125 km) flows into the larger Aisne (356 km) 121 km below its source. The Aisne joins the smaller Oise about 94 km before it drains in the Seine. ^ The Loir (317.4 km) flows in the Sarthe (314 km). 9.2 km later the Sarthe joins the Mayenne to form the short Maine river, which flows into the Loire after just 11.5 km. ^ The 380 km Tarn flows into the Garonne about 230 km before it meets the ocean. As both its volume and catchment area are larger, the Tarn is hydrologically the upper part of the Garonne river. ^ Starting from the Ruda-Garona, the longest headwater of the Garonne. Length (54 km in Spain, 521 km in France) and catchment area exclude the Gironde estuary. ^ The 226 km Sil flows into the Minho about 135 km above the Minho reaches the ocean. ^ The commonly given 80,000+ km2 for the drainage area includes the 7740 km2 basin of the Sorraia, here treated as a primary river. ^ The 167 km Záncara joins the 155 km Cigüela (or Gigüela) and the 76 km Guadiana Alto in a trifurcation some 755 km before the Guadiana reaches the ocean. On some maps, the following 77 km are still called Cigüela. See the Spanish Guadiana article on the confusion in this river system. ^ The Guadiana Alto/Viejo source river is 76 km long. ^ Hydrologically the Guardiana Menor and its longest source river the Guardal (a.k.a. Barbata) form the true upper course of the Guadalquivir, which has a nominal length of 657 km. Barbata/Guardal - Guardiana Menor (206 km) meets the nominal Guadalquivir 138 km below its source. ^ The 453 km long Doubs joins the upper Saône to form the 171 km long Grand Saône, which flows into the Rhône 333 km above its mouth in the Mediterranean. ^ The furthest headstream of the Arno could be considered the 19th-century, 62 km Canale Maestro della Chiana [fr; it] that drains part of Valdichiana into the Arno about 30 km below its source for a total length of over 270 km. 306 km2 has been subtracted from the HydroBasins area for the endorheic Lake Trasimeno. ^ The 9 km Negrino is the longer source stream of the 276 km Tanaro. ^ Hydrologically, this is one river with the upper courses of the Rienz, Eisack and Adige/Etsch as tributaries, as it forms the longest course and has the largest discharge at each junction. The ca 130 km long Ahr->Rienz->Eisack originating under the Dreiherrnspitze joins the 409 km long Adige/Etch 103 km below the latter's nominal source. ^ The 17 km long Karlinbach, originating under the Weißkugel, flows into the Reschensee, about 5 km below the official source under the Reschen Pass of the 409 km long Adige/Etsch. ^ The Trebišnjica enters the Hutovo Blato marshland in Bosnia through a complex underground karst system. From here a portion of its waters continues the 9 km long Krupa to join the Neretva. Other portions appear as outlets on the coast, e.g. in Neum in Bosnia, in Slano and most significantly near Dubrovnik in Croatia as the 30 m short Ombla river into the Rijeka Dubrovačka ria. ^ The Drin (343 km from its most distant source) drains partly in the Adriatic, but the main channel, called Drinasa, joins the 44 km Bojana 3 km after that emerges from Lake Skadar. ^ The Sateska (38 km) flows into the Black Drin (149 km) less than 4 km after Black Drin's emergence from Lake Ohrid. Black Drin meets White Drin 145 km later to form the Drin proper (160 km). The drainage area (but not the length) includes the 1394 km2 Lake Prespa basin, which drains underground through very porous karst mountains into Lake Ohrid. ^ The 132 km long Treska flows into the Vardar about 261 km above its mouth in the Aegean Sea. ^ The often-mentioned 17,323 km2 drainage area is much too large, as the total area drained by the Meriç (including Ergene) in Turkey is only 14,560 km2. ^ The most distant source for the Prut may be via the 167 km Cheremosh tributary. ^ Siret length estimates range from 559 km to 726 km. The shorter length is supported by HydroBasins data. ^ The 237 km-long Dâmbovița forms at the confluence of 8 km Valea Vladului and 6.5 km Valea Otic . ^ Hydrologically, this is a single river, as it follows at both junctions the river with the greatest length, drainage area and average discharge. The Great Morava (185 km) is formed by the merger of the West and South Morava. The 276 km Ibar joins the West Morava 89 km before it becomes the Great Morava. ^ Drainage area is hard to estimate due to the connectivity of the karst system. The most detailed level of HydroBasins data gives a lower drainage area (87197 km2) as it excludes local basins connected as such. ^ The 140 km Tara is the larger and longer of the two source rivers of the 346 km Drina. The most detailed level of HydroBasins data gives a lower drainage area (18820 km2) as it excludes local basins connected underground via the karst system. ^ Drainage area is hard to estimate due to the connectivity of the karst system. The most detailed level of HydroBasins data gives a lower drainage area (8076 km2) as it excludes local basins connected underground as such. ^ The 415 km Someș joins the Tisza 696 km before its mouth in the Danube.The average discharge is that measured at Szeged, which is higher than at places downstream. ^ The Tisza used to be 1,419 km long, but through canalization between 1846 and 1880 was reduced to its current length of 966 km. The average discharge is for that at Szeged, where it is higher than at places downstream. ^ Average discharge as measured at Arad, where it is higher than at places downstream. ^ The 286 km Hornád river joins the 229 km Sajó 32 km before the latter streams into the Tisza. ^ At the junction 47 km from its nominal source, the upper Drau is in every hydrological aspect a tributary of the Isel. The longer Isel, 65 km from the Schwarzach source under the Rötspitze, continues straight, is on average almost 3x larger in volume, and drains twice as large a basin. Below the junction the Drau/Drava is 663 km long. ^ Zala (139 km) is the longest and primary inflow of Lake Balaton. 70 km across, Balaton is drained by the 121 km Sió, a water course created in the 3rd century CE. ^ The 78 km Schwarza is the longest source river of the 180 km Leitha. ^ The Austrian a.k.a. German Thaya (76 km) joins the Moravian Thaya (68 km) to form Thaya proper (235 km). The catchment area of 12,772 km2 given in the source accidentally excludes the Kyjovka tributary. ^ Leutascher Ache (30 km) joins the Isar (291.5 km) 26.1 km below its source. ^ The Breitach (24.3 km from Turabach source) joins with the Trettach (15.6 km) to form the Iller (146 km). ^ The Southern Bug is 857 km long when including its liman; the given drainage area does include the Inhul, which empties in this liman. ^ Vovcha (323 km) joins the Samara 222 km below its source and 98 km before their discharge in the Dnieper. ^ 327 km Uday flows into the Sula (363 km) about 120 km above Sula merges into the Dnieper. ^ Kalaus (436 km) is the upstream section of Manych (nominally 420 km); Kalaus used to split up into the (West) Manych and East Kanych, but the east branch has been dammed off. The 78 km long Yankul joins the Kalaus 365 km before it changes its name to Manych. ^ The Chembar (119 km including the upper Chembar) joins the Vorona (454 km) 392 km before the Vorona flows into the Khopyor. ^ Length includes the Ullukam source river, which at its confluence with Uchkulan forms the Kuban. ^ Discharge is that for the north and south arm of the delta combined. ^ Many other sources, e.g. , give a 1515 km length, but this is not supported by the HydroBasins data. ^ Many other sources, e.g. , give a 1264 km length, but this is not supported by the HydroBasins data. The combined length of the Araks-lower Kura system is nearly as long as the Kura itself. ^ The discharge is for the middle part of the river; at the mouth it is only 9.8 m3/s due to agricultural use and divergence of water towards the Tbilisi reservoir. Before the completion of the Mingachevir reservoir it was a tributary of the Alazani. ^ In Georgia, the Pirikiti Alazani (44 km) and Tushetis Alazani (48 km) form the Andi Koysu, which 144 km later joins the Avar Koysu (178 km) to form the 169 km long Sulak River. ^ The Oka River, 1559 km starting from the Uperta source river, joins the Volga 1299 km below its source and 2231 km before its discharge in the Caspian Sea. ^ The 1967 km Kama (1805 km river and 162 km fairway through a full Kuybyshev Reservoir) joins the Volga 1804 km above the mouth. The Kama has a nearly identical mean discharge and length as the Volga (it may have been significantly longer before the reservoirs were created), while unlike the Volga it doesn't change direction at the meeting point, so that hydrologically the Volga could be considered a tributary of the Kama. ^ Akhtuba is a distributary of Volga that flows parallel to it, joining at multiple places. ^ Before the filling of the Volgograd Reservoir in 1961, Yeruslan River was at least 400 km long and had a catchment area of more than 12,000 km2. ^ Chernava (75 km) joins Maly Irgiz (235 km) 48km below its source. ^ Bitkul (34 km) joins Tok (306 km) 28 km below its source. ^ Before the filling of the Kuybyshev Reservoir in 1957, Cheremshan River was at least 440 km long and had a catchment area of more than 15,300 km2. ^ The catchment area and length include the Kama-derived part of the Kuybyshev Reservoir. At full capacity, the reservoir extends to the junction with the Vyatka, shortening Kama as a river to 1805 km. Before the creation of the four large reservoirs in its course, the Kama River was 2030 km long up to the junction with the Volga. ^ The 96 km Belaya source river joins the 1314 km Vyatka 92 km below Vyatka's source. ^ The 91 km Tyatep joins the 535 km Dyoma 70 km below Dyoma's source. ^ The 549 km long Ay joins the Ufa 382 km before that flows in to the Belaya. ^ The 307 km Inzer joins the 239 km Sim just 6 km before that flows into the Belaya. Before their junction, Sim's discharge is >48 m3/s and Inzer's is 51 to 67 m3/s, but the 6 km joined stretch is named Sim. ^ Includes the catchment area of the Sylva tributary. Since the building of the Kama Hydroelectric Station both rivers now feed into an arm of the Kama Reservoir. ^ Typyl (68 km) joins Kosva (238 km), 53 km below the source of the Kosva. ^ a b c Drainage area but not the length includes the reservoir arm derived from the river. ^ Kolva (460 km) joins the Vishera (415 km) just 34 km before the Vishera streams into the Kama. ^ Discharge unknown; calculated from the fraction of the Vishera basin comprised by the Kolva basin. ^ The 234 km Glukhaya Vilva joins the 176 km Yazva 38 km before that flows into the Vishera. ^ The 41 km Malaya Sviyaga joins the 375 km Sviyaga 37 km after the latter's source. ^ The Kadada (153 km from its Tahtala source) joins the 841 km Sura 137 km below the source of the Sura itself. ^ The 70 km Cheka joins the 436 km Pyana 53 km below its source. ^ The 168 km Cheka joins the 296 km Alatyr 160 km below the source of the Alatyr itself. ^ The 63 km long Uperta joins the 345 km Upa 52 km below its source. Upa then flows into the 1504 km-long Oka 1203 km before the Oka joins the Volga. ^ Osinovka (37 km) joins Tsna (451 km) 31 km below Tsna's source. ^ The 64 km Demina joins the 399 km Ugra 27 km below its source. ^ The 63 km Uperta joins the 345 km Upa 293 km before that joins the Oka. ^ The 426 km long Unzha originates at the confluence of the 105 km long Kema and 89 km long Lyndonga rivers. ^ The Sheksna was about 700 km long and had a catchment area of ca 39,000 km2 before the creation of the Rybinsk Reservoir in 1947. ^ The Mologa was about 700 km long and had a catchment area of over 37,000 km2 before the creation of the Rybinsk Reservoir in 1947. ^ The 146 km long Lid joins the 242 km Chagodoshcha 140 km before it flows into the Mologa. ^ The average discharge is measured at stations in the upper part of the river. ^ Discharge unknown; calculated from the fraction of the Ilek basin comprised by the Chobda basin. SWRR = State Water Register of Russia; GSE = Great Soviet Encyclopedia, 1969–1978 edition; IEU = Internet Encyclopedia of Ukraine. ^ "Pechora At Oksino". R-ArcticNet. ^ "Pizhma (Komi Republic)". SWRR. ^ "Izhma At Izhma". R-ArcticNet. ^ "Usa (Komi Republic)". SWRR. ^ a b c d e f g h i j k l m n o p q r s t u v w x y z aa ab ac ad ae af ag ah ai aj Nilsson, Reidy, Dynesius and Revenga (2005). "Fragmentation and Flow Regulation of the World's Large River Systems" (PDF). Science. 308 (5720): 405–408. doi:10.1126/science.1107887. PMID 15831757. CS1 maint: Multiple names: authors list (link) Provides the "Virgin mean annual discharge[, which] refers to the most water-rich river channel section, in most cases close to the estuary, before any significant direct human manipulation" for a number of primary rivers.